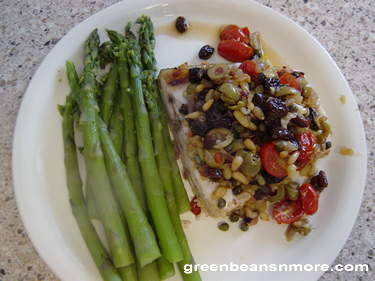 I found this flavorful swordfish recipe on Allrecipes. Since I've been cooking more Mediterranean based dishes I have olives and capers in my refrigerator on a regular basis. I always have olive oil, onion and garlic and I had raisins from the broccoli salad I made. We have a local farm stand with fresh tomatoes, so the rest was easy! My husband, who insisted he doesn't like raisins enjoyed them in this dish. As you can see, I served it with asparagus, another of our favorite vegetables. Heat the olive oil in a saucepan over high heat and saute onion and garlic until soft. Stir in the raisins. tomatoes, olives, pine nuts and capers. Cover, reduce heat to medium and cook 15 minutes. Season the swordfish with salt and pepper. Place in lightly oiled baking dish and cover with cooked sauce. Bake for 15 - 20 minutes or until steaks are firm.